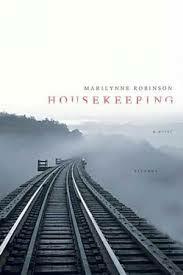 I’ve read all of Marilynne Robinson’s novels but this one, Gilead (2004), Home (2008), and Lila (2014) – all terrific. So I was interested in reading this book even prior to a reading group. Housekeeping is about a lot of things, including housekeeping. Mostly it’s about “transience” as so many reviewers say, the impermanence of things, people, families. And although it’s written in beautiful, lyrical, Biblical, transcendent prose it’s an all-American novel. Ruth Stone, the 1st person narrator, was left with her sister on their widowed grandmother’s porch when they were about 5 and 7 years old, respectively. Mom’s husband had disappeared and then so did she, off a cliff into the same lake where Gradpa lost his life in a train catastrophe. So the girls lived with Grandma until her sudden death and Grandma’s elderly sisters came. But the job was too much for those two, so they called the sister of the girls’ mother, Sylvia, to come help out. And come Sylvia did, by riding the rails, a vagrant, if you will, to care for two young girls in the tiny mountainside town of Fingerbone, Idaho. So there they grew. and the house went shabby and their clothes small and untidy, the food not what the ladies of the community thought it ought to be, and their school attendance very irregular. There is trouble, but more importantly, there is loss, memory, absence, grief. The lake itself is the representation of death, the seasons are cold, the emptiness of their lives apparent. I very much enjoyed this book, the writing is superb with apt and original metaphors, interesting structure going back and forth in time via memory and exquisitely sympathetic characters. Although it’s only 219 pages, it’s not a quick read.